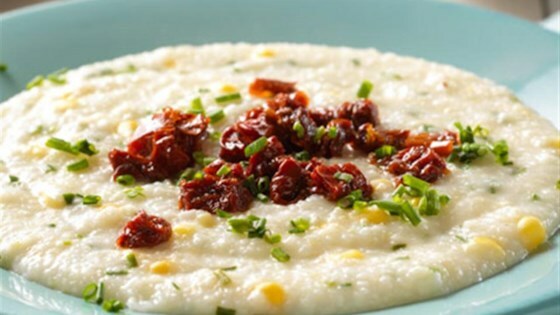 "Super quick, these grits with corn kernels and fresh chives are topped with sun-dried tomatoes and avocado slices and served with your favorite hot sauce." In saucepan, crumble tube of ready-to-heat grits, and heat over medium heat with 1/2 cup coconut milk until hot and creamy, about 5 minutes. Add corn kernels. Continue cooking for another 5 minutes. Add olive oil, salt, and chives and combine well before portioning into 4 bowls. Garnish with sundried tomatoes, avocado slices, and the reserved chive. Serve with your favorite hot sauce. Another good alternative would be quick grits. You can also add a little bit of vegan butter from a stick, such as Earth Balance brand, to help warm up the tone of the grits.